Last year, when M.A.C released it's 'Quite Cute' collection, it came baring a searing neon pink lipstick that sold out in lightning time. If you missed it, you might just be in luck next month but you'll have to be quick. M.A.C fans are to vote for their favorite shades starting March 12 on Facebook. 18 popular lipsticks, lipglasses and eye shadows have been selected from past collections; the three shades with the most votes from each category will come back as an online exclusive, limited edition collection. Voting opens to all Facebook fans March 12 -30. The collection will be available online in North America in August and internationally Fall 2012. You can see the full release I made on what shades are being released here. 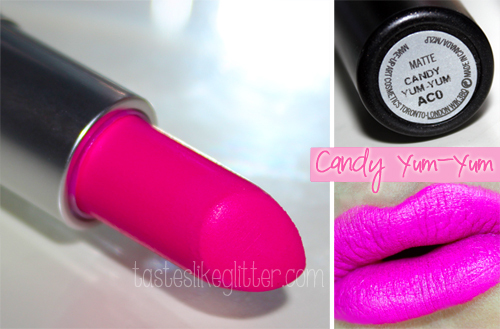 Candy Yum-Yum is a bright, blue based neon magenta pink. It's a matte finish and has opaque coverage. For a matte, this isn't as dry as some I've tried but I still find it easier to work with mattes with a balm underneath. As you can see that gives it a slightly less matte finish but it helps them glide onto the lips without dragging. The colour is just amazing and it breaks my camera trying to capture it. The bullet colour isn't a very colour accurate photo. It really is that neon. It lasts a considerably amount of time on the lips, due to it's matte finish. Though as it's so bright it can start to look patchy after eating so it's worth having it handy because touch ups are definitely needed. It's not your everyday lipstick but it's such a great addition. If you're thinking of getting it, don't hang about. I've a feeling like last year, it won't be around very long before it's sold out.